Calibrate all your Thermocouple, RTD instruments AND your milliamp loops with the PIE 525Plus. 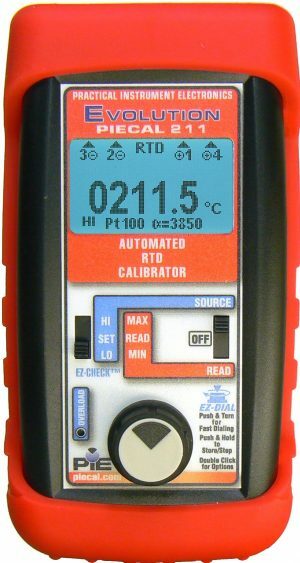 It has all the functions of a 12 type RTD calibrator, 14 type thermocouple calibrator and can source 0 to 24 milliamps or simulate a two wire transmitter like a milliamp calibrator. You may also perform stand alone calibrations of two wire transmitters by simultaneously supplying the RTD or thermocouple input signal while supplying the 24 volts to power up the transmitter and monitoring the milliamp output signal. Powers HART™ transmitters with built-in 250 ohm resistor simplifying hookups with HART communicators. Trouble shoot sensor connections and find broken wires with patented technology. 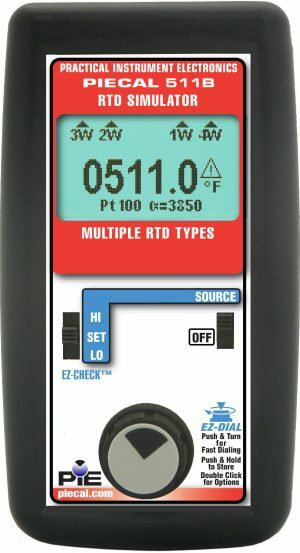 Connect your two, three or four wire RTDs and the PIE 525Plus automatically detects the connections and measures the RTD in degrees C or F. Secondary display shows the resistance value corresponding to the RTD temperature. 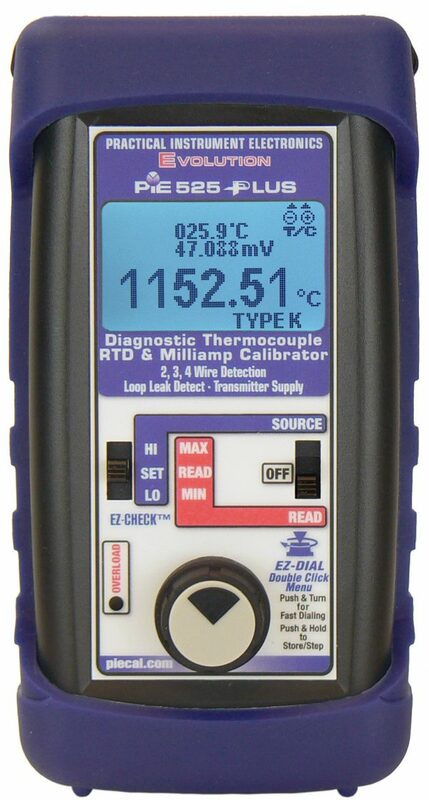 No competitor’s calibrator is compatible with as many process instruments; also displays excitation current to confirm your RTD transmitter is working properly. The internal cold junction thermistor is accurate to ±0.05°C and is traceable to NIST. The sensor is thermally bonded to an isothermal mass including brass blocks with screw terminals for connection of bare thermocouple wires along with a miniature thermocouple connector for fast connections. An extremely stable voltage reference and low drift components make it more accurate than most other handheld & benchtop thermocouple calibrators. 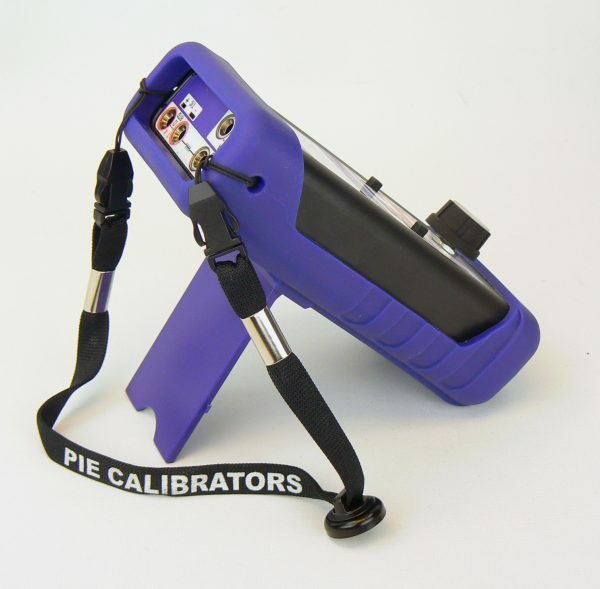 The PIE 525Plus is capable of meeting the requirements of an AMS 2750 Field Test Instrument when certified by an accredited laboratory. 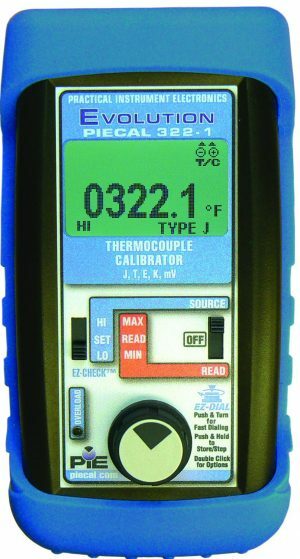 Troubleshoot thermocouple probes by measuring the resistance of the cables and sensing element, allowing you to replace high resistance probes before they burn out. Open thermocouples and ones with impending failure are indicated by “OPEN TC” and the resistance value on the 525Plus display. 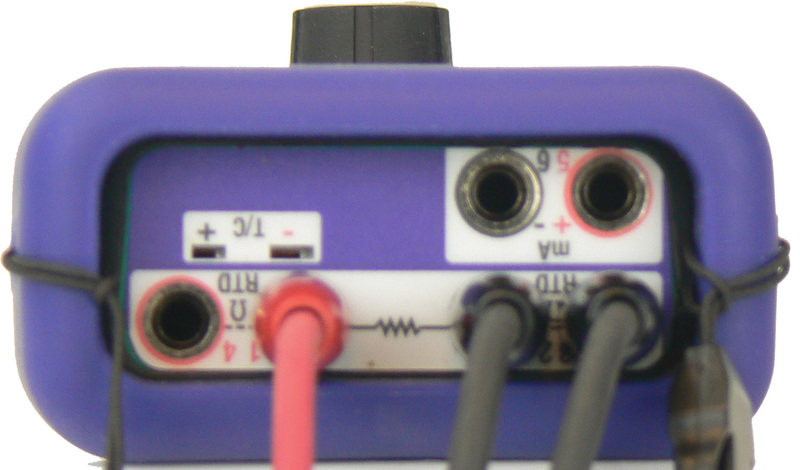 With the built-in milliamp calibrator you can check, calibrate and measure all your current signal instruments in a 4 to 20 milliamp loop. It can be used at any access point in your loop. 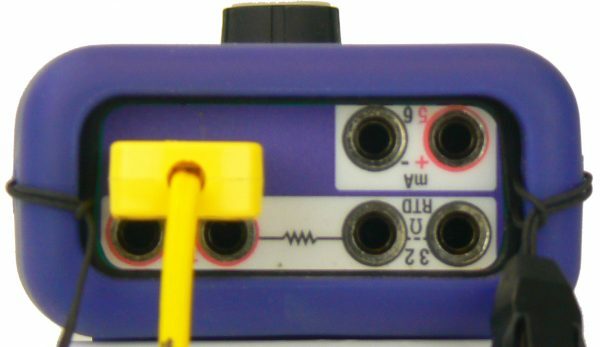 Source & Read 0.000 to 24.000 mA, Simulate a 2 Wire Transmitter or use the PIE 525Plus to simultaneously power your 2 Wire Transmitter and measure its output while simulating the sensor input. 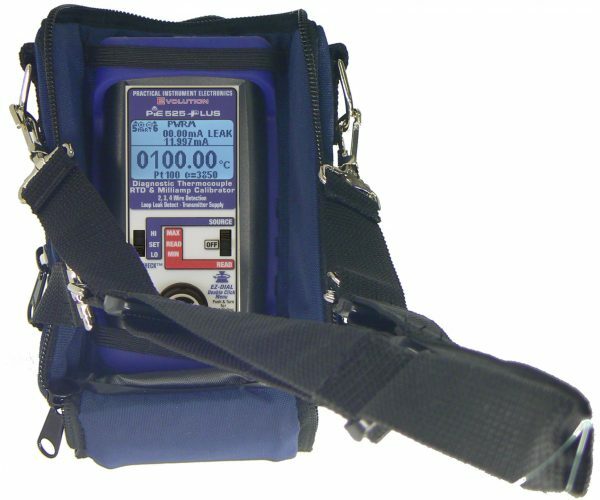 Turn on Ground Leak Detection and use the PIE 525Plus to power up the loop. Any current that isn’t controlled by the transmitter or other current control element will be indicated as leakage on the calibrator’s display. Using a PIE 525Plus to power the loop the technician detects a leakage of 0.51 mA – the same offset seen in the control room. He walks the loop and opens a junction box releasing a stream of water. The loop is again in control. Clink on the link below to see a video demonstation of Loop Diagnostics in action.